Few things transport you in time like your sense of smell! 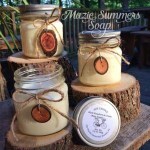 Just as our soaps enable you to get away from it all, you can continue your journey with our hand poured soy candles. Made from all natural soy wax from U.S. grown soybeans and natural cotton wicks, these highly scented candles emit little to no soot. The candle remembers so be prepared to burn your candle until the melt pool reaches the edge of the jar to prevent tunneling! Make sure the wick is trimmed to 1/4" before burning. Never leave a burning candle unattended. Apple Bourbon Maple - If you can never get enough of fall scents, this one is for you with the aroma of plump apples, sweet maple, and rich, smooth bourbon. Apple Mango Tango - Bursting with the scent of fresh mango and apple slices. Black Raspberry & Creme - A delicious fragrance of dark berries warmed by vanilla. Bayberry has hints of woodsy spruce and holiday berries. Mint Mojito - Mint of peppermint and eucalyptus with tropical undertones of pineapple and sugarcane. Orange You Sassy - Strong and bold-- true orange and chili pepper! Seaside Cotton - Fresh ozone marine notes which blend nicely with romantic base notes of sheer musk and amber resulting in a light and clean scent! You're A Peach - Smells like the freshest peach...ever...picked. Loblolly Breeze - All things winter - snow, pine trees, simmering cranberries and spices! Hansel & Gretel's House - a classic gingerbread house covered with vanilla frosting, cinnamon sticks, toasted graham crackers and juicy raisins. Pumpkin Pecan Waffles - A very rich, warm, buttery vanilla fragrance with a hint of cream. Cranberry Marmalade - A luscious blend of tart cranberries, spiced apples, and fresh California orange peel. Juniper Breeze - Refreshing scent of forest greens, jasmine, green apple and musk. Salted Caramel -Sweet caramelized sugar and warm vanilla cream with a hint of sea salt.